Back in July, we mentioned that Louis Vuittion would be among many other high-end brands to open a store in the newly renovated Santa Monica Place. Last Friday, August 6th, was the grand opening of the Louis Vuitton store at the new Santa Monica Place. The flagship marks the 137th Louis Vuitton store in North America. At the Santa Monica location you’ll find 4,139 square feet of Louis Vuitton goodies. The store will carry pieces from past, present and future collections which includes items such as women’s and men’s leather goods, luggage, city bags, as well as the latest shoes, belts, sunglasses, scarves and other accessories. Santa Monica is energized with all the creativity, innovation and artistic excellence that Louis Vuitton stands for, said Charles Delapalme, SVP of Louis Vuitton’s Western Region. We are proud to make it our newest home in Los Angeles. The store layout offers three distinctive areas. 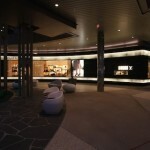 The women’s area features a Louis Vuitton “bag bar,” a display of small leather goods and dedicated accessories. Near, is a elegant lounge area that showcases women’s shoes as well as rare productions. Lastly, a men’s area that provides a selection of leather goods, shoes, luggage and accessories.